If you grew up in church, there’s a good chance you were taught a pretty simple message about the afterlife: When you die, you either go to heaven, or you go to hell—both of which will last forever and never change. Many Christians believe that at the moment they die, they get to go to heaven, and nonbelievers spend eternity being punished in hell. But author John Eldredge thinks we’ve gotten it all wrong. His new book, All Things New: A Revolutionary Look at Heaven and the Coming Kingdom, challenges the basic precepts of modern Christian thinking about the afterlife. According to him, eternity isn’t about escaping Earth for a church service in the sky—it’s about creating a new Earth that everyone will have a chance to participate in. 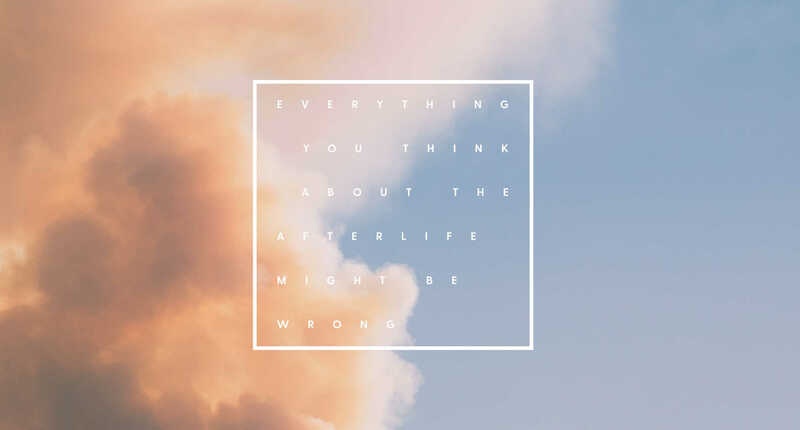 We recently spoke with Eldredge about why he wanted to tackle the controversial (just ask Rob Bell) topic of the afterlife, what happens when people die and what the Bible might really say about heaven and hell. Any time you’re challenging modern Christian conceptions of eternity, it can be controversial. Why is it something you wanted to write about? One, because we’re in a big crisis of hope right now. The world is just trashed, and people really don’t have a lot to hope for. And two, I think they don’t have a lot to hope for because what we’ve handed to them is sort of the Christian answer: Here is the great, stunning hope that God offers you: an eternal church service in the sky—which is unbiblical, and it’s also totally unappealing. I mean, who wants that? I’ve heard a lot of worship leaders and pastors say from the pulpit or on stage, “Hey, I can’t wait until we’re with the Lord, we’ll get to worship forever.” They’re not saying that because they’re trying to deceive. It’s just what we got handed. I think we got ripped off. The big thing we lost is that you actually don’t spend your eternal life in heaven. You spend it here on the new Earth. And I think that’s where we got off track. So when the Bible says there will be this new earth after the Second Coming and the dead in Christ will rise, is it actually talking about planet Earth right now? or is this a new physical/spiritual destination? Let’s use a couple things to help us get to the answer. First off, look at the story God is telling: A loving and creative father creates Earth; gives it to us, powerful sons and daughters who are creative like He is; and He tells us to reign. And then the human tragedy happens, and the train wreck, and then Christ comes. And Jesus begins to demonstrate restoration. Almost all of His miracles are not random proof that He is the Son of God—they are illustrations for His message, and His message is the coming of the Kingdom of God. The blind see, the deaf hear, the lame walk and the dead are raised. It’s restoration. Reality is one continual existence. Your unending life has actually already begun, and a restored you is in a restored Earth. God doesn’t change the reality. [Another example] of that is Christ at His resurrection. He’s the forerunner, right? He’s raised from the dead, but He’s still Jesus. Like He literally still has the scars in His hands and feet. Same guy. Same Lord. Same person. Same personality. In Romans 8, Paul says that all creation, meaning this created world—including, by the way, the animal kingdom—groans for the day of its redemption when the sons and daughters of God are revealed. So what you get in the flow of the story is a very clear message of things being restored versus one reality being exchanged for another. What are the implications for how Christians believe about hell and eternity? It is a very, very difficult thing to discuss what the future is of those who do not choose God. And the question is, are you the kind of person who even wants to be around God, to be in His unfiltered presence? If the answer is yes, you get in and if the answer is no, then He will arrange the best that He possibly can for you outside His presence which is going to be a pretty dark place. for a lot of Christians, this could potentially be a massive revelation because it challenges not just the nature of what we think about eternity, but the nature of what we think about God. Most sincere believers believe that life is eventually lost. That everything you love, everything you hold dear, all of it eventually gets destroyed or burned up or goes away and we go somewhere else to spend our eternal life—a vague heaven, a worship service that lasts forever, something like that. But the bottom line is that in the human heart, this experience feels like loss, and [we need] to begin to understand that nothing is lost. When Jesus promises the restoration, He says, “I tell you the truth that the renewal of all things, you who have followed me and have lost (Matthew 19:28-29)”—and then He gets very specific—houses, careers, loved ones, He says, that it is going to be restored to you. I long for my restoration. I want my brokenness healed. And it is. I’m a different person than I was 20 years ago. But it’s a process that I can continue to participate in knowing that it’s going to be fully accomplished, knowing that we can care for things like the Earth, because the Earth is not going to be destroyed. It’s going to be restored. We can care for things like cultures because God fully intends on restoring them. He cares about this. Yeah. You’re right. It’s huge. The other thing many of us were taught is that eternity begins the moment you die—that death is this sort of demarcation and transfer point from now until the heaven that we’ll always know. If there is a continuity and the new earth that is heaven is to come, what do you think happens to people who die in the meantime? Well, heaven is clearly in the meantime. That’s the role that heaven plays in Scripture. So, heaven is where the precious ones of God are now, any soul that longs to be in the presence of God is now. Preserved, whole, well, enjoying themselves and I think, actually actively involved in the coming kingdom. For example, the trumpet blast sounds and Christ returns. It says that the hosts of heaven return with Him. There’s an active participation. They’re not bored either. They’re not singing forever either. Heaven is where our dear ones are now who have passed away, and the restored Earth takes place at the coming of Christ and ushers in what Scripture refers to as the coming age—kind of the next chapter in the story right here on the planet you love. For the thief on the other side of Jesus, is his opportunity to experience restoration done at that point? How will it be handled in terms of a continued chance to be restored and be a part of this new creation? C.S. Lewis wondered that too. He wrote a fascinating book that those of you who are wondering about that might enjoy called The Great Divorce in which people are given kind of one last opportunity to experience heaven and experience the kingdom and see if they want it. Because the whole point is this: If you want to be with Jesus as He reigns on the new Earth, He is going to make room for that. Sadly, there are two types of human beings: There are those who are moving in a direction of longing for the presence of God and there are those human personalities who are actually moving away, they do not want goodness; they can’t stand to be around love; they don’t want the presence of God in their current existence. Well, how could they possibly endure the unfiltered presence of God on the new Earth? Because the dwelling of God will be with man, He will fully manifest. So they are moving further and further away from the One who created them, and I think that God will do everything in His ability to offer them the taste of what could be. But if in their very soul they’re saying, I don’t want that, He says, “OK, then you have to go where I don’t exist.” And that is not an enviable option. What does it mean for caring for the earth, our bodies, communities, neighbors and culture knowing that we’re on a path to restoration, not escaping this fireball that everything is going to be consumed by? How does it affect your day-to-day life as a Christian? Hope. Hope is the most powerful thing. Because it’s hopelessness that causes us to give up. It’s hopelessness that causes us to pull out, right? Of a marriage, of a community, of a culture, of the earth. It’s hopelessness that causes people to quit. You have to actively participate in hope. It’s not something that just happens to you. You don’t get hope like you get the flu. You have to take hold of it. You will actually be the kind of person who then naturally engages the world because you’re not hopeless. You’re not giving up because you’re filled with hope.